A couple weeks before I was due to fly home, I got a call from my mom asking me if I wanted to extend my trip and stay through another weekend, instead of leaving on a Saturday like I had planned. Hmmm....why would I want to do that? Well, so I could road trip with my parents to Kansas to find a cookie jar. That's why. I'll tell you all about that cookie jar, just keep reading. We started our drive north on Friday afternoon in some rainy skies. A few hours later we were in Stillwater, OK - home to Oklahoma State University, Eskimo Joe's, and my little brother. I thought I was so cool in elementary school at summer gymnastics camp at OSU when I got to eat at Joe's. This time it'd been years since I'd eaten there, and the burgers were definitely better in my memory. There's the little (bigger) brother. Tanner had saved a few alfajores from his summer trip to Argentina and Peru, and was kind enough to share his guarded stash with me. Then I went and left it at his house. I'm still thinking about it, and thinking that I need to take a trip south next spring to get some alfajores for myself. Time to get back on the road again, leaving Tanner behind. A few hours later we reached the middle of nowhere. Our final destination of Larned, KS, doesn't really have too many lodging options, so we opted to stay in Great Bend, which, if you look at a map, you will indeed see that it's in the middle of nowhere. Not really anything to do once our eight hours of driving were over, so we went to sleep in some motel. Next morning, we got up early and had breakfast at Perkins, which is some chain? It was early. Early! And cold and rainy. My breakfast sandwich was really good. On the road again, 40 miles or so into Larned. The morning sky is always so great. Too bad I can't usually be bothered to wake up early enough to see it. Okay - we're here at our destination in Larned, at a giant auction site so we can buy a glass cookie jar. But not just any cookie jar, you see. A family heirloom cookie jar from my great-grandma's cookie company that existed in Kansas City many years ago - Mrs Flick's Famous Oatmeal Cookies. My mom's been looking for one of these jars for years. They were placed around the Kansas City area at convenience stores and restaurants in the 1950s or so, and you could buy 3 of these famous cookies for 5 cents. What a deal! These jars have now popped up at antique stores and auctions, and my grandma and aunt have both managed to get one. Mom lost out on a phone auction a couple years ago, and when she saw a jar on the sale bill for this auction in Larned, by golly, we were gonna drive up there and make sure we could take it home. The sale bill photos showed a jar in great condition, and we were prepared to pay top dollar. So, here we are at the auction, early, so we can register and get a number. Plenty of time to look around at all the other things for sale. Anyone know Grandy's? I looooved eating there as a kid. Here's a cinnamon roll case. See that pretty square cake plate? I thought it was really pretty. Remember it. So, the auction begins in the garage room, not the room where the cookie jar was sitting. We'd have to wait awhile. I'd never been to a real auction, and man, things move fast! One guy on the mic, and three guys are just picking up stuff on all these trailers, grouping it together, and bam, it's sold. They cleared several flat bed trailers full of stuff in just over an hour. Finally around noon, we moved into the other room with the church pews and sat down to wait for the cookie jar. Lots of items, and guys were just grabbing random things and holding them up. Soon, there was a line of ducks placed on the main counter. Bidding for your choice of 1 duck. My dad got instantly animated and had to have one. Or two. Apparently there were two that are big collector duck decoys? See - I'm learning stuff again. By Cyril Bethel? I'd never heard of him, but a lot of people apparently know him and his hand carved duck decoys from the 1940s. Before I knew it, Dad had won them both. They're now sitting in his office. Finally, I see a guy grab the cookie jar from its position and bring it toward the front. He's waiting his turn to hold it up while the other two guys are selling their items. I nudged Mom to make sure she was ready. My heart was pounding - this was it! It was going to happen so fast! Would we win? How much would it go for? How many other people know about this and would there be a war? We already knew there was a phone bid. About thirty seconds later, several back and forths with another lady sitting up front, we were crowned the victors! Our eight hour one-way drive was not in vain! Granted, we paid 3x what it had been priced at the antique store, but who cares! Victors! And with that, we paid our bloated auction bill and got out of there. Here are a few more photos of town, in case you never make it to Larned yourself. We stopped somewhere, maybe Hutchinson?, to get some lunch. When I saw Spangles, I knew we had to stop. What a name! In the middle of nowhere! When we got back into Oklahoma, I checked in on Foursquare at a restaurant, and look what I got! 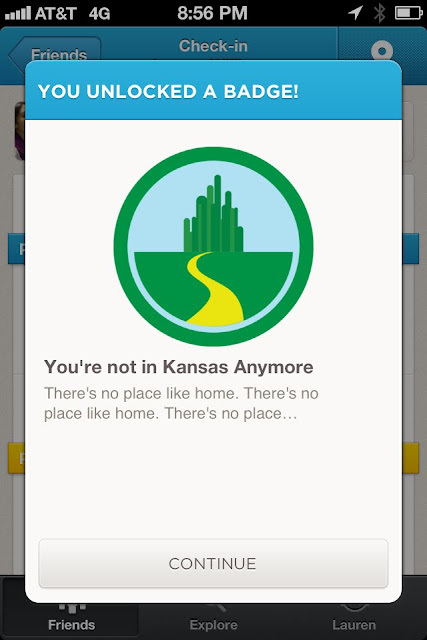 Pretty clever, Foursquare. On the way home we stopped in Tulsa to see my best, best friend and her rapidly growing family. Third baby on the way any day now, plus two orphans in Haiti that should be coming to live with them soon. I don't know how she's managed such a crazy year, but if anyone can, it's her. We had some pizza and hung out with the munchkins. We eventually made it home to a dog that had missed us. Isn't that a sweet face? This photo was probably taken shortly after I'd given her the post-dinner rawhide stick. While she eats dinner in the laundry room, you're supposed to hide a stick somewhere in the living room. I kept forgetting to do this, so I'd watch her come in and start sniffing around, and then I'd feel bad that I forgot. And she'll bug you until you remember. She MUST have one. Then she takes it into the same little spot and chows down on it like a drug. So happy we got this. Back out to the farm for one last night before I headed back to LA. I'd wanted to hold a bonfire, but there had just been too much rain. Dad and I went out to try anyway. I needed some s'mores! We hopped into the mule and drove up the hill. Honey rides under your legs, instead of running. We found a few little dry sticks and Dad managed to get enough going to roast a marshmallow or two. I had one more work day before I got back on a plane. We had lunch again at the little Mexican store. And I had one last Braum's MIX, because Braum's is the BEST. Bye, Oklahoma. See you again sometime! Your airport looks like the lobby of a retirement home. I should know. I've seen a few retirement home lobbies in my day.